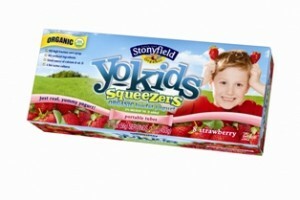 Or as my kids call them, "tube yogurts." My girls are really into yogurt- really into it. As in, requesting it with each and every meal. Perhaps you do not have this problem at your house, but in mine, nobody wants to use a spoon. No. It's much more fun to scoop yogurt out of the cup with your hands, lick it up like a kitty, or slurp it with a straw. All of these activities end in a huge yogurty mess- and involve utensils I will later have to wash. I'm not saying the Squeezers are completely mess free. They're certainly mess-less, and leave more clean spoons in my drawer. This is essential in our constant battle against the great spoon shortage of every morning when all Mommy wants to do is to eat her Raisin Nut Bran in peace... but all the spoons are mid-wash cycle in the dishwasher. A big fan of Yes To Carrots products, and foaming stuff, this appealed to me right away and jumped from the shelves of Walgreens right into my basket. I'm not sure why foaming soaps make me giggle inside, but they do. (why aren't you giggling?!) I have been struggling to find the right shampoo for my girls' fine, yet perma-greasy hair. The foam actually gets down into the roots much easier, doesn't need a lot of friction- ie girls yelling at me not to pull their hair- to get a good lather. And it smells nice, just pleasant... not a punch you in the face kind of fragrance- which I appreciate. When we picked up Bunny's new glasses, the nice little clerk handed me a microfiber towel, and an itsy bitsy bottle of eyeglass cleaner. I had no idea what I was in for; The amount of peanut butter, unidentifiable stickiness, pizza grease, and general crud that girl can get all over her glasses in a microscopic amount of time is astounding. I am scrubbing those lenses about ten times a day. The 2 oz. cleanser lasted a week... at most. Windex caused a weird reaction with the anti-glare coating, and I didn't want to wear that coating off! I was on the hunt for a solution for four months. Trying to buy lens cleaner in bulk was turning out to be expensive and... impossible. My problem being that I was focusing my search too narrowly on eyeglass cleaner and photographic lens cleaner. The answer was right under my nose in the car washing department at Target: Invisible Glass. Freaking 22 liquid ounces of pure messy glasses cleaning bliss. While I have yet to use it on my car's windshield, it works great on our plasma TV, and my laptop screen, too! Now that Squirt's glasses are on order, I have purchased a second bottle... because I am going to need it. Little Man is now 15 months. He is walking- avidly. He is reaching- skillfully. He is ripping down anything I have on the edge of counters... or stuffed on shelves. He is driving me crazy with his intense desire to explore everything in my house. The easiest of his prey? Dangling cords! So you can understand why I got a little crazy upon spotting these apple cores. I ordered up a ton. They arrived days later, and the socks were knocked right off my feeties. I went back and ordered a bazillion more. 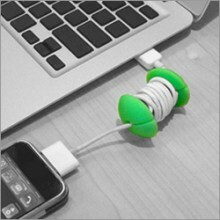 Yes, they're great for my delicate ipod earphones, and the ipod cable... the apple stuff. However! They are awesome for keeping my cellphone charger neat and tidy, for keeping the six, yes SIX baby monitor (three upstairs, three downstairs) cords from making my house look like a snake infested jungle. They're also cheapy cheap. Oh! And Bonus! I have a 10% off coupon code for you! (BG7Q35BQ82V0G) You're very welcome.